Join in whenever you want and go at your own pace. Basically, do what you want, when you want. This is just a form of inspiration. Sew in between other projects, make your other projects fit in with the challenge, whatever you want to do! Oh, and of course share your creations!! 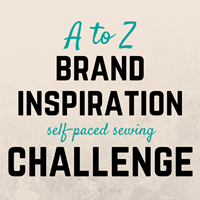 Join the Flickr group, use the hashtag #atozsewingchallenge, link back to this page so other people know what’s going on, and make sure to grab a button!! You know you do it anyway… you see something in the store or online and create your own. So lets join forces and share the inspiration! Of note: I have yet to hashtag anything and I just opened the Flickr group in hopes you will join me! haha so don’t worry if it’s a little slow to get going! What are you waiting for!? You know “A” is calling your name… How about Anthropologie, ASOS, Adore Me, Armani Exchange, Anna Sui, Adidas, or Alexander McQueen? What other ‘A’s can you think of?? Find all of my A to Z Challenge projects to date here! Previous PostIntroducing Charlotte & The Foxglove Duo!